Flower making is an art that requires a lot of patience. It usually involves a delicate process, requiring immense concentration and a steady hand. 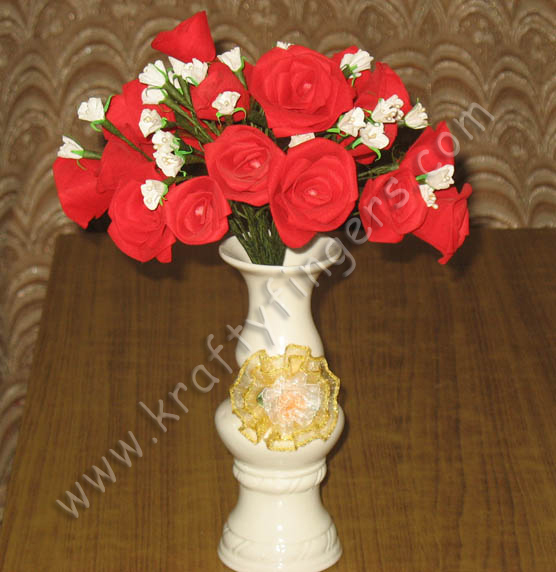 The red roses, in the picture above, are made of cloth, and the white carnation buds are of paper. Same goes for the sepals of the two varieties. And the stems are made of aluminum wire, covered with green self-adhesive tape. The white paper flowers are relatively easier to make. But, the red roses are very time-consuming. First the stem has to be prepared, with a tiny bud in the center. Then each petal is cut and shaped separately (in different sizes). And finally, the petals are tied one-by-one on the prepared stem, smaller ones inside, and bigger ones outside. Number of petals required depends upon the size of the flower. These handmade flowers can be used individually or in small groups, for gift packing your party favours or making wedding placards. In the picture above, you'll see mostly medium sized roses, along with some small rose buds. But slightly bigger 'king-size' roses can also be made. Eligible for super savings under Special Offer - "BAKERS-DOZEN"